City rolls over unrepresented indigent citizen. Ron on the Right Of Way in Front of His House. There used to be a 100 year old house where the new homes are in the background. 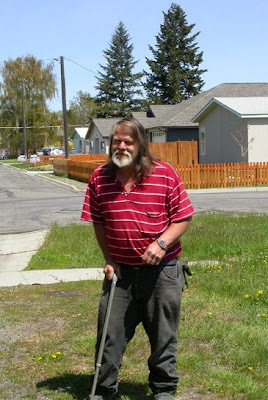 Ron is a lifelong resident of Baker City. For 34 of his 58 years, he has lived on the corner of Fifth and Grace streets. When he was young, most of the streets were not paved and many were without curbs and sidewalks, but people liked their semi-rural lifestyles and were used to living without the amenities found in the larger cities of the west. People had a live and let live attitude and did not intrude upon the affairs of their neighbors or tell them how to live. A lot of people, including Ron, learned to get along as best they could, and they saved and stored things they thought they might need to get by. He attended Baker schools, but due to some cognitive difficulties and other problems, he did not graduate and can barely read or write. (His friend Diane reads his mail for him and helps him with his other matters requiring those skills.) Not long after his teenage years, he was helping his father pour concrete for the Culley Lane overpass when he fell down into a hole filled with rebar and wet concrete, severely damaging his feet. A subsequent botched surgery left one of them nearly useless. Over the years since then, he has gotten along as best he could doing concrete work, welding, and odd jobs, until his knees went out, and the injuries to his arms and shoulders from accidents at his mining claim left him disabled. During his working years, he helped remodel many Baker City Buildings, including the County Court House and City Hall. Since then it has been a challenge to just keep a roof over his head. In addition to his mangled feet and chronic pain, he has a torn rotator cuff in his left shoulder, and he lost strength in that arm and leg due to several mini-strokes. He has had bone transplant surgery on his right arm, and he can’t get it over his head. Due to these problems and others, his doctor has him on a box full of prescriptions. Mr. Calder owns a small 1 bedroom, 1 bath home on about 1/4th acre right next to the railroad tracks where 5th Street is interrupted by them. The home was built 109 years ago and the assessor’s office says the structure has a real market value (RMV) of $4,190. By contrast, a 2 year old, 3 bedroom, 2 bath home just up the street has a RMV for the structure alone of $140,840. With the land, the assessor’s office thinks the residence has an RMV of $167,870. 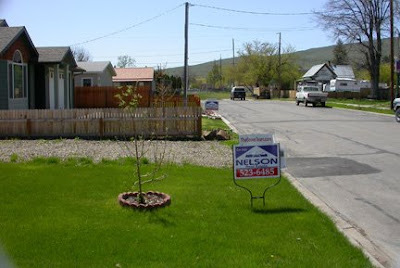 Nelson’s Real Estate is trying to sell it today for $179, 900, as well as another newer home next door for $125,000. The average RMV of the other four houses facing 5th Street on that block is $74, 42.00. It would appear that the two houses Nelson’s Real Estate is trying to sell, at prices so much higher than the average for that block, are a bit out of place. Might be hard to sell them at that location unless everyone else’s home is spruced up or bulldozed, especially with the train tracks so close. Maybe that’s where the police department comes in. Looking down 5th street towards Ron’s house in corner at upper right. The story goes that one of Ron’s neighbors was solicited to make a complaint by Shannon Regan, Baker City’s Code Enforcement Officer, but they refused. (No one can offer any proof that this is the case, and because the City has said that it won’t release the names of those who complain, we will probably never know who actually filed it.) Mr. Calder ultimately came to believe that the complaint was associated with the sale of the expensive house up the street. 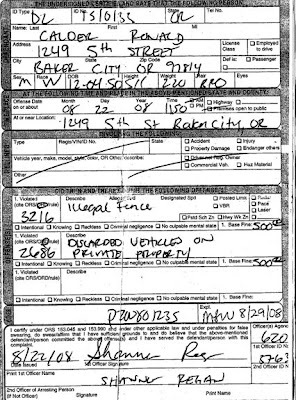 On August 22, 2008, Shannon Regan issued Ron a citation for violations of Ordinance 3216, an “illegal Fence” and Ordinance 2686, “Discarded Vehicles on Private Property.” The fence portion of the citation was subsequently dismissed. I asked two of Ron’s neighbors up the street about the complaint. One characterized him as an “Inoffensive neighbor” and the other said that Ron had never caused them any trouble or been a bother of any kind. Ron felt the same way. The Police Department has been over to the house 3 or 4 times during this episode and on one visit they brought along Mike Pina of the Planning Department. Ron said that Mike and the others wanted him to let them into his trailers without a warrant so they could look around. Ron cooperated by letting them on the property, but just let them look inside, rather than, I would guess, go on a fishing expedition. While it was not listed in the complaint, not long before his May 13th appearance, the police department told Ron that the City Manager wanted him to remove all personal items from the right of way in front of his house. 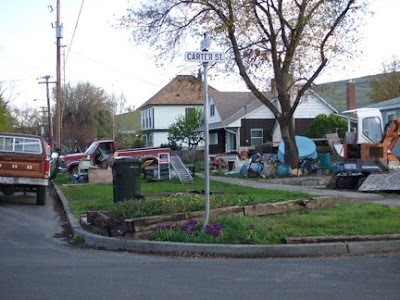 Below is a photo of the 5th Street right of way in front of Ron’s house. It dead-ends at the railroad tracks just to the left of the photo. He has worked to remove his things. Ron says he has mowed and taken care of this right of way for over 34 years, having worn out several mowers on it. He said that some years ago he received a verbal okay and agreement, first by Tim Collins and then by Milo Pope. He says they agreed that so long as Ron agreed to maintain the right of way he could use it for his own private use. He says the police recently told him that he can’t even drive on it or park in front of his house, even though people park on similar right of ways all over town. Because he had no place to put the firewood he stored in front of the fence, he ended up giving away around 5 cords despite the fact that it is his primary source of heat, and it would be nearly impossible to go out and cut replacement wood. He says they also told him he had to get rid of freezers he stored meat in, his washer and dryer he had outside, and the oil barrel he uses for backup heat, even though none of these things were on the original citation. There is nothing in the citation that relates to these issues. He also said they suggested that he and a neighbor were running an unlicensed business subject to another citation. He says that the only business he’s currently engaged in is the “survival business,” and that his mining claim is a hobby. Even the IRS doesn’t call a consistently unprofitable enterprise or hobby a business. Because he is in the “survival business,” he has accumulated a lot of things he finds useful in that endeavor. In that respect, Ron is not a lot different than many of us who pride ourselves on self reliance and making do with what we can make from what we have, including salvage materials that others may see as eyesores. While the court order says Ron agreed to remove camp trailers with mining equipment in them, he maintains that he only agreed to move the mining equipment on utility trailers that had been stored on the right of way in front of his house. He had planned to take the equipment up to his mining claim, which is at a little over 7,000 foot elevation, but the late winter/spring snow pack has made the roads inaccessible. In looking at his camp trailers, I have only found one that is inoperable, and that should be easily remedied by pumping up the tire. All the rest have the tires pumped up, and I didn’t see any that would fit the ordinances definition of “discarded vehicle” that is cited in the complaint. If this is the case, on what basis is the court asking him to remove them? The citation only mentions “Discarded Vehicles,” not operable vehicles with mining equipment in them. There are two, perhaps three, motor vehicles that are currently inoperable, and one old Toyota truck that a neighbor would like to fix up. All but the Toyota can be fixed as Ron gets help. He says he tried to put a starter in one last fall, but the part didn’t work. The worst enemy he has had in getting the motor vehicles running since that time, besides the fact that he is disabled and has to have someone else do a lot of the work, is the deep snow and freezing temperatures we all had to deal with this last winter. He has no building in which to work on the cars, so the work must be done outside in the elements in the dirt, mud or snow. Mr. Calder has worked to meet the City’s demands for six months now, doing what he can, weather permitting, almost every day. He says his doctor has informed him that this work has been detrimental to his health and has made his condition worse. He would like to comply where health and safety, or public property storage issues actually exist, but given his situation, he needs more time, certainly more than seven days. Where the City seems to be infringing on his private property rights, he feels he has needed legal representation, but he can’t afford it. A look around Mr. Calders’s neighborhood reveals two other significant issues. One is that many others could also be cited for similar types of alleged violations, but have not been. 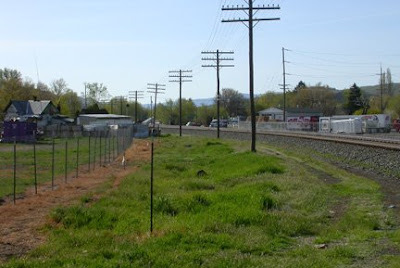 The other is that his property does not look significantly different than many other properties along the tracks in the area, much of which is zoned industrial. 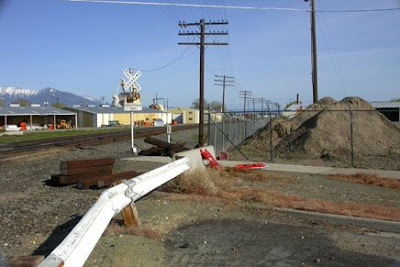 A look along the tracks at the back of his property reveals an industrial zone right across the tracks and in the nearby areas to the northwest. Granted, the vast majority of those along the corridor created by the tracks are ether commercial, or belong to the City, but their character is similar to that found on the Calder property. I have no issue with or complaint about the conditions found on nearby properties, and they are only included here to show that they exist and are being ignored, while Mr. Calder is being cited. Captions refer to photos above them. These are the camp trailers in Mr. Calder's yard. He stores mining equipment, tools, and other personal items in them. 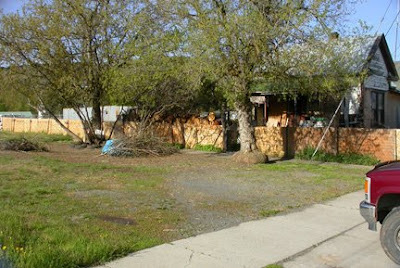 Ron’s Property starts behind the Garbage Bin and wood fence on Left. Distributing company is over the tracks. 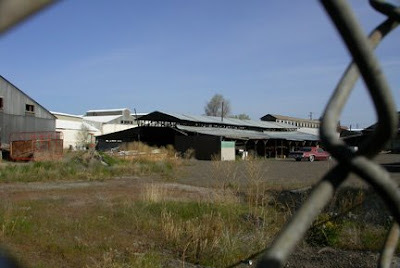 This photo is of the abandoned industrial zone about 2 blocks up the tracks. This is another picture of the industrial zone, 1 block to the northwest. Examples of possible violations are abundant in the city and in Ron’s neighborhood. One can be found 1&1/2 houses up from Mr. Calder’s home. 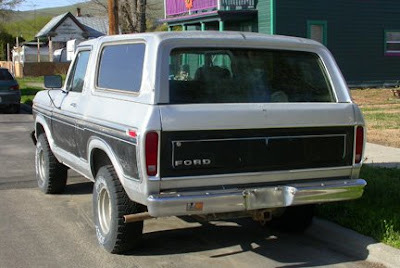 The unlicensed Ford Bronco in the photo below is said to have been in the same place on the City’s street for a year or more now, a clear violation, and yet nothing has been done about it. Unlicensed Ford Bronco. Ron’s home is in upper left. Residence on Carter Street nearby. Conditions near tracks 2 blocks up on Auburn. Another residence within 5 Blocks. This residence is across the tracks and up two blocks. 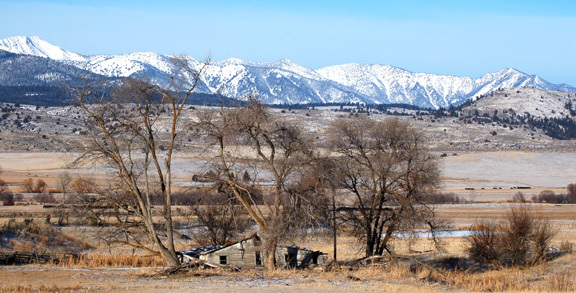 These photos are just a few examples of how some people live in Baker City. Numerous examples can be found that would not meet the standards of many in the middle and upper classes. Does it give the powerful a right to harass, intimidate, and inflict financial and emotional harm upon them? What’s different about these situations that would have the City picking on Ron Calder while ignoring these and many other similar situations throughout the City? Does it have something to do with the fact that Nelson Real Estate is selling two expensive, overpriced, and out of place homes just a few doors up from Ron? Or is it that Mr. Calder is simply easy pickings for example setting? I don’t know, but I do know that the City’s actions reek of a high-handed abuse of power that sets the stage for running over the rights of other Baker City residents who are not in a position to defend them selves. If they can do it to Ron Calder, they can do it to others. The last, and perhaps most troubling aspect of this episode, is the way the City and Court have treated an unrepresented indigent and disabled citizen. This is a classic case of indigent or otherwise powerless people appearing in court without legal representation or other means to defend themselves. In this case, with non-representation, illiteracy, cognitive and physical disability issues, and low income tragically converging, the defendant is literally defenseless. This is because, even though we pride ourselves about cherished rights, freedoms and democracy, and even though we provide some minimal defense to indigent people in criminal cases and certain types of civil cases, there are no provisions in law to force a local jurisdiction to provide legal counsel for anyone in a civil case for alleged property maintenance violations. This leaves unscrupulous City Managers who have arranged for unwarranted power, and Police Departments looking for justification of their expansion, with the ability to prey on people who have few options and no way to defend themselves. Although many states have a few statutes granting right to counsel in certain cases relating to child custody, health, safety, shelter and sustenance, in Oregon there is currently no general right to civil counsel for many of these categories, including property maintenance and other ordinance violation allegations. The lack of counsel for low income, disabled, or otherwise resourceless defendants often leads to a forfeiture of rights because the defendant has no real idea as to what those rights are or how to enforce them. The police may come in and attempt to intimidate and coerce the victim with threats of other, often baseless charges, such as illegally operating a business. They may expand the nature of the complaint beyond that which was originally alleged to areas not covered in the original citation. They may put a person’s health at risk by forcing them to work beyond their capabilities, especially when they are disabled and don’t have money to hire a crew to make the demanded changes ( “abatement”). All of these things may have occurred in the case of Mr. Calder. Ultimately, because the defendant is unable to comply with their demands, the local authorities, lacking any conscience, may come in and forcefully abate the property with their own crews, hauling off any property they find offensive and charging the victim far more money than would have been necessary if they had been able to do it themselves. Because the defendant lacks the money to pay for the work, the City will then place a lien on the property. Recognizing a wrong when they see it, the American Bar Association unanimously passed a resolution in August of 2006 that called for a right to counsel in civil cases relating to human needs. Until our American “civilization” advances and legislates such a right, we will continue to see the powerful prey on the powerless in ways that defy the American values we say we cherish. One wonders how much property the City will end up owning before the Ayatollah and his militia end the Jihad on our hapless low income residents. Hopefully the City Council will assert their ultimate authority to put an end to this before any more people are hurt. If anyone knows an attorney who would like to offer Ron some pro bono legal help, please call 541-523-2376 and leave a message with a contact phone number. Thanks to your gracious reception of Ron Calder's appeal this morning. I will gladly post something of reasonable length, say three pages not counting a reasonable number of photos, if the City would like to give me their side of the story. I would appreciate any information in addition to that, if the City will provide it. We will prepare a staff report on this matter that will be available for the public. In our case, it’s not “our side of the story” but the laws and their interpretation by many lawyers and judges over the years. I appreciate the opportunity, but I’m sure it will all be publicly presented in the near future. Mr. Calder filed the following appeal at about 9:50 this morning. My name is Ronald Calder. My address is 1249 5th Street, Baker City 97814. My phone number is 541---------. My message phone number is 541----------. 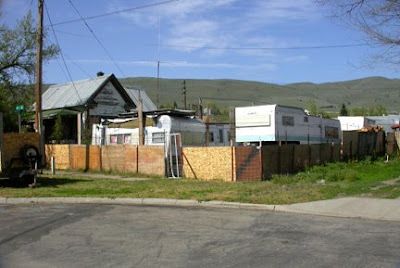 I am the owner of the property at 1249 5th Street and on August 22, 2008, I was cited (Citation and Complaint # ’08-50851) by Baker City Police Officer Shannon Regan for alleged violations of Ordinance 3216, maintaining an illegal fence, and Ordinance 2686, having discarded vehicles on my private property at that address. On May 13, 2009, a Judgement and Order for that case, number 08 V 1901, was issued by Baker County Justice of the Peace, Lise F. Yervasi. This letter is a request of appeal to you to amend that Judgement and Order. I would like an appeal hearing. This appeal has been filed with the City Recorder’s Office within five days after the decision of the County Justice Court, which has heard the case. 1. As a disabled, largely illiterate, low income person, I have not been able to adequately defend myself against the charges brought by the City because no public defender has been provided, and I cannot afford one. I did not graduate from high school, can barely read or write, have cognitive issues, and have been disabled since 1987. I was officially classified as disabled in 1991. 2. Ordinance 2686, relating to motor vehicles discarded on private property, calls for, in Section 6, a “Hearing by Municipal Court.” My hearing was not held in a Municipal Court as there is none. Therefore, the complaint and order should be dismissed. 3. In the original complaint dated 8/22/08, the City only identified 2 motor vehicles that they thought were “discarded,” but during the course of this issue being presented before Judge Yervasi, Officer Regan was allowed to make a very confusing assault against me to include all aspects of my property that she deemed in violation of any City ordinance. 4. The order states that I agreed to do things I did not agree to do. For example, I did not agree to move all my camp trailers off my private property. I only agreed to move the mining equipment and utility trailers that had been stored on the right of way in front of my house. 5. My camp trailers are not discarded, inoperative, wrecked, dismantled, partially dismantled, abandoned or junked, so there is no basis for removing them under any interpretation of the ordinances cited in the citation and complaint. 6. The title of the ordinance in question, 2686, refers to motor vehicles, but the ordinance defines “vehicles.” This shows that the intent is to control storage of motor vehicles, not the camp trailers referred to in the Judgment and Order. 7. The Court and/or the City had no right to try to have me agree to things that were not related to the original complaint, as no complaint concerning those other issues had been filed. 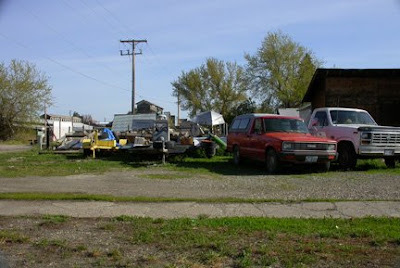 Debris and scrap metal were not part of the original complaint for “discarded vehicles” on private property. Likewise, the city had no authority to attempt to force me to remove personal items such as a full freezer, my oil barrel, my washer and dryer, or other items, without a formal complaint and citation. 8. Additionally, Judge Yervasi has apparently allowed Officer Regan to disallow any use of the public right of way located on the portion of 5th Street that runs along the front of my house. 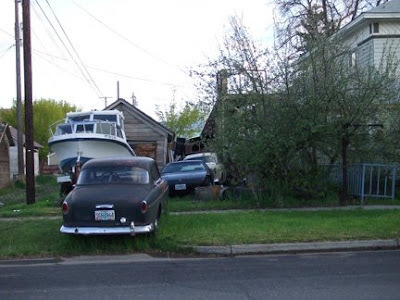 I am now told I am no longer allowed the use of this right of way to access the front or south side of my house, even to park, but other citizens throughout Baker City are allowed to park on the public rights of way in front of their homes. Because of the layout of my property this has resulted in severely limited access onto my own property. 9. Even if the Court is determined to have been legally correct to require me to do the things they wanted me to do, my physical condition and the winter weather conditions they expected me to work in were not fairly considered in the hearings. My disabilities and financial condition made it impossible for me to have complied with their demands. 10. The improvements I was able to make were not recognized by the Court and I was given no credit for my attempts, even though they have resulted in a deterioration of my health. I can elaborate at the appeal hearing. In summary, I believe that this all has been allowed to go far beyond the issue of the citation. I believe that both Judge Yervasi and Officer Regan have been very unfair to me in this entire matter. I believe I have not been given any consideration for what I have already done, or for what I continue to do on a daily basis to try to comply. Additionally, I was not given any consideration that throughout all of this I have been doing the majority of the cleanup solely on my own, despite my being disabled, and that it was expected of me to do these things in the worst of winter. I definitely believe that my punishment for the supposed ordinance violation handed down by Judge Yervasi in her judgment and order that now requires me to remove "everything within my personal property not located within an enclosed structure or she will have it all removed by the City on her behalf,” and that it goes far beyond anything that can be justified by the original complaint. 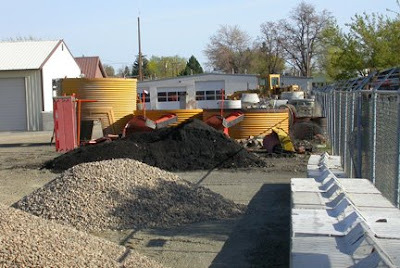 I respectfully request, and it is to my understanding, that neither the City nor the Court will take any further actions against me, Ronald G. Calder, or my property located at 1249 5th Street Baker City, Baker Co., Oregon, until the appeal is heard by the City Council and their final decision in this matter is given. I also ask that demands made by the Court requiring removal of items, or other actions, not covered in the original citation be rescinded. For any decision regarding actions to alleviate a situation relating to “discarded vehicles,” I request that my disabilities and financial situation be taken into account so that I have adequate time to comply. I have included a copy of the ticket and a copy of the final judgment and order for your convenience. Thank you for your just consideration in this matter. I provided the personal details for this appeal. This appeal was read to me, I agree with what is written in it, and to the best of my ability, I believe the contents to be true and correct. CC: Lise F. Yervasi, Justice of the Peace in the Justice Court of the State of Oregon for Baker County District 1. I request that the City Recorder, or her representative also sign this document, and my copy, in the spaces provided below, to show that the appeal was received in a timely manner. While Ron and I were giving a copy of the appeal to the Justice of the Peace's ofice this AM, I ran into an acquaitance who had received a $150.00 ticket for exceeding the 25 mph speed limit on 17th street below Pocahontas. I understand that the Police Department gave several tickets in one day there recently. Unstated quotas for patrol officers as the end of the fiscal year approaches?